Running a business is about more than simply having a dream: successful entrepreneurs need a core competency in accounting, leadership, and more. Entrepreneurship spans all stages of business development, including legal issues, funding and finance, marketing and business management. Our program will provide the core knowledge necessary for you to realize your entrepreneurial vision. Courses are taught by working professionals with many years of business experience. Utilizing our small interpersonal classroom setting, students are able to connect with their professors and peers, developing business and networking relationships early in their professional careers. 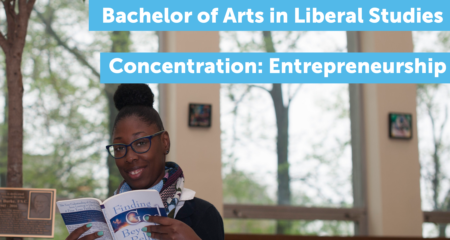 The Bachelor of Arts in Liberal Studies with a Concentration in Entrepreneurship will prepare you to take your ideas and passions and turn them into a viable business. Small class sizes ensure that our faculty are invested in student outcomes, and hands-on learning opportunities combined with innovative teaching ensure that students are competitive applicants upon graduation. Our dedicated faculty don’t treat you like a number; they get to know you and work with you the entire length of your time at Manor. There are so many reasons why you belong here! Students will begin by learning about the fundamentals of communication skills, business, psychology, and accounting, before moving into more advanced coursework on leadership dynamics, strategic planning, business analytics, and composition. Students are required to take part in an approved business internship during their senior year, for which they will receive school credit. The Liberal Studies with a Concentration in Entrepreneurship program is 120/121 credits in total. What career can you have with an Entrepreneurship degree? Marketing manager, financial analyst, sales representative, and business administrator are all examples of job titles that rely on a background in entrepreneurship. Want to learn more about this program? Talk to our admissions office at (215) 884-2216 or email admissions@manor.edu. The Basil Guarantee is a tuition discount and exclusive benefit for all students enrolling in a Bachelor’s degree program. With the Basil Guarantee students who enroll in a bachelor’s degree at Manor College are eligible to receive $2,000 off tuition for the final two years (junior/senior year) of the program. * The Basil Guarantee is a limited time offer that is available for all students who enroll (full-time) in the program between Fall 2018 and Spring 2020. At Manor College, 97% of students receive financial aid, Manor is committed to making our personalized education experience possible for all students, both academically and financially. Manor College is also the best priced private Catholic college in the state of Pennsylvania and for the 2018-2019 academic year, Manor College has announced a tuition freeze, meaning the 2018/2019 tuition of $16,429/year and $17,199 for Allied Health students will not increase, but remain the same.